Try Halloween electric candles inside your pumpkin. Halloween electric candles are much safer to use than real candles with open flames. These electric candles are also extremely versatile, and you can use them in almost all of your Halloween decorating, both indoors and outside. Electric candles are battery operated, and the light comes from an LED light bulb rather than an open flame. These candles generally look like the real thing, especially from a distance, and some are even made to flicker just like a real flame would. Electric candles can be used almost anywhere, as they won't damage ceilings or overhead shelves, and they produce absolutely no smoke or soot. Some electric candles are scented, giving off a light fragrance as a real scented candle does. You can safely use electric candles outside, as there's no worry about the wind blowing out the flame. They are also safe for use around children and pets, and can be placed inside containers or other holders, even those with a lid. Halloween is the perfect holiday for candles. Most of the parties are held at night, as home décor, both inside and out, is well lit. Children go trick or treating in the dark, making lighted outdoor displays a necessity. The most common outdoor Halloween decoration is the jack o'lantern, which is a hollowed out pumpkin with a face or other pattern carved into the side. A small light is inserted into the candle, making the face or pattern glow and flicker. Any gust of wind can blow them out. Accidentally knocking the pumpkin causes the melted wax to spill. The tea lights are small, and if they are inexpensive, poor quality candles, they won't last very long. 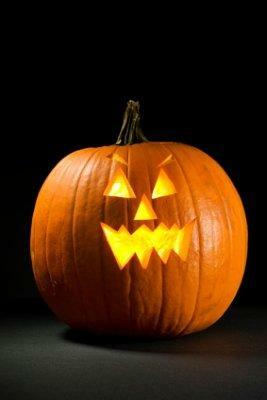 The candles can be tricky to light before placing inside the pumpkin without burning your hand. Likewise, it can be difficult to light the candle while it's sitting inside the pumpkin without a special candle lighter. Electric candles are the perfect solution to conquer all of the problems. You won't have to worry about ventilating the top "lid" of your pumpkin, the electric candle will not go out in the wind, and there's no messy wax or dangerous flame to deal with. Simply turn the electric candle on, place it inside the pumpkin, and you're finished. Place spooky, flickering electric candles in the windows to give off a ghoulish glow in the dark. Hang electric lanterns from tree branches or even stair rails. Paint spider webs, spiders, and other Halloween themes on the outsides of jelly jars or other clear glass containers. Place electric candles inside the jars to illuminate the paintings. Light up the pathway to your door with small electric candles to help young children see their way in the dark. For an indoor party, line shelves of bookcases or the tops of high cabinets with small electric tealights for subtle and slightly eerie lighting. Create table centerpieces easily with Halloween decorations made of any material, and include electric candles nestled amongst the themed items. The candles give off no flame or heat, so they're safe to use in the middle of a centerpiece. Candles have always been a large part of Halloween decorating, and now you can be even more flexible with where you place your candles, thanks to Halloween electric candles.